I decided to scrap the puzzles. I love them and will continue to do crosswords every day. But I need to marshall my resources towards my main theme. I am having a lot of trouble right now eating reasonably so, FOCUS! Maybe I shall start including recipes. The problem is that it is very hard for me to say a pinch of this, a half cup of something else. Mostly I combine a bunch of stuff and keep adding and tweaking until it tastes right. So, tonight’s dinner. We are trying to de-clutter the freezer and came across this prime steak that we had bought with some others at Costco for a dinner party. It was small and so a good size for the two of us. We were feeling bummed because we had just watched Federer lose in the semi-finals of Wimbledon. But as a salute to our tennis hero, we opened this bottle of wine that was bottled when he was eighteen and we were much younger! Although John cooked the meat quite rare, it was still wonderful. I steamed the potatoes and assembled the salad with croutons that I sautéed slowly in some butter and olive oil plus thyme. I have made croutons in the oven and on the stovetop and trust me, the ones on the stovetop are infinitely better. Some new potatoes were steamed and served with olive oil and parsley. 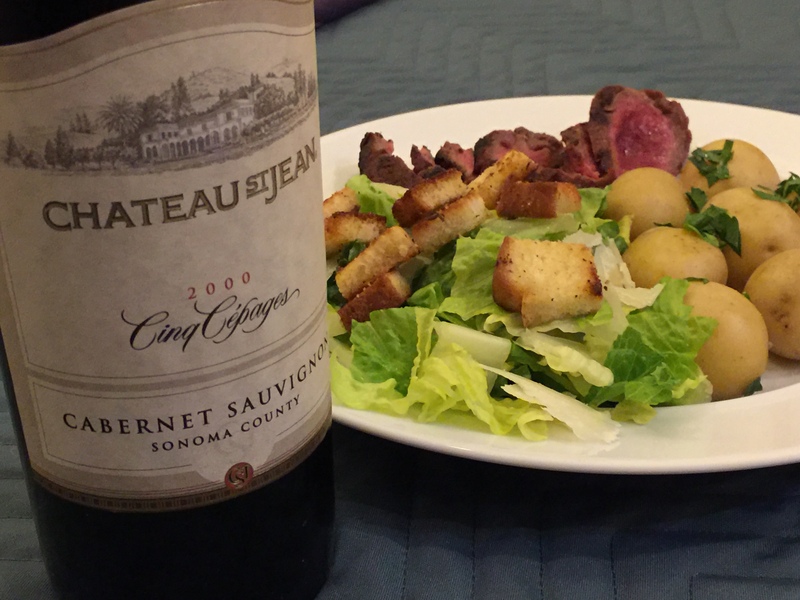 This entry was posted in Beef and tagged Caesar salad, new potatoes, ribeye steak. Bookmark the permalink.